Israeli Prime Minister Benjamin Netanyahu appears to be on the verge of securing a record fifth term in office as votes continue to be counted in Tuesday’s election. Last night, Netanyahu and his top challenger, ex-military chief Benny Gantz, both claimed victory in the tight race. With most of the votes counted, Netanyahu’s Likud party and Gantz’s newly formed Blue and White party have both secured 35 seats in the Knesset, but Netanyahu has a clearer path to forming a coalition government with the help of his right-wing allies. Tuesday’s election came just days after Benjamin Netanyahu vowed to annex Israeli settlements in the occupied West Bank in defiance of international law, and more than a week after Netanyahu thanked President Trump for recognizing Israel’s sovereignty over the occupied Golan Heights. Netanyahu ran for re-election despite facing possible criminal indictments in three corruption cases. We speak with Israeli journalist Haggai Matar and Palestinian attorney Diana Buttu. PRIME MINISTER BENJAMIN NETANYAHU: [translated] It is a night of colossal victory. Colossal. I am very moved that the people of Israel put their trust in me again, for the fifth time — a greater trust, even. I intend to quickly finish the work in order to form a national stable government. AMY GOODMAN: Tuesday’s election came just days after Benjamin Netanyahu vowed to annex Israeli settlements in the occupied West Bank in defiance of international law, and a week after Netanyahu thanked President Trump for recognizing Israel’s sovereignty over the occupied Golan Heights. Netanyahu ran for re-election despite facing possible criminal indictments in three corruption cases. Netanyahu’s chief rival was Benny Gantz, a former chief of staff of Israel Defense Forces. On Tuesday, he, too, claimed victory. BENNY GANTZ: It’s a historic event, actually, never happened in Israel before. And we’ll take it from here. It’s just the first night. We’ll see the real results. I’m sure and confident that we can do it. We will continue. Thank you very much. JUAN GONZÁLEZ: Many Palestinians living in Israel boycotted Tuesday’s election. Netayahu’s Likud party was also accused of voter intimidation after placing 1,200 hidden cameras at polling stations in Arab neighborhoods inside Israel. Palestinian chief negotiator Saeb Erekat spoke earlier today about the impact of the election. SAEB EREKAT: I think we have just witnessed a clear-cut vote by the Israelis to maintain the status quo, as far as we, Palestinians, are concerned. This was a vote to maintain the status quo, to maintain apartheid. I think in the new elections, from the exit polls, I think there are only 18 seats in the 120-seat Knesset that support the two-state solution on the 1967 lines. AMY GOODMAN: We’re joined now by two guests. Haggai Matar is an Israeli journalist, activist and union organizer. He’s the executive director of 972–Advancement of Citizen Journalism, the nonprofit that publishes +972 Magazine. He joins us from Tel Aviv. And in the Israeli city of Haifa, we’re joined by Palestinian attorney Diana Buttu. She was a — she is a former adviser to Palestinian President Mahmoud Abbas and has served as a legal adviser to the Palestinians in negotiations with Israel. She’s a Palestinian citizen of Israel. Welcome, both, to Democracy Now! Haggai Matar, let’s begin with you. Explain the significance of these elections. Although we don’t know the final result at this point, it does look like Prime Minister Benjamin Netanyahu has won a record fifth term. HAGGAI MATAR: You’re right, Amy. And thank you very much for having me. I think we can very clearly say that Netanyahu will be the next prime minister and will have his fifth term come in. This, actually, as Saeb Erekat said, the vote we have seen is a vote for the status quo, not only on the Palestinian issue, but generally. This has been a vote wherein Israelis have, in mass, said that they want to keep things just as they are. If you look at Jewish Israelis, then it’s a very, very clear, wide vote to keep things as they are on all different political, social, economical fronts in Israel. JUAN GONZÁLEZ: And yet, the number of seats that the Likud won is still relatively small. How do you account for the fractious nature of Israeli politics, with so many different parties, always requiring a coalition to govern? HAGGAI MATAR: So, first of all, Netanyahu actually got more votes this time and more seats in Knesset than he did the last time, which I think is very considerable, especially considering that he’s facing several very serious criminal charges for political corruption. To be able to get actually more seats in Knesset than he did, with these criminal charges, is quite an accomplishment. At the same time, we need to understand that the other parties that will be joining his coalition government have all stated in advance that they will join him. So, a vote, for example, for the religious parties in Israel, for the extreme-right settler parties and others was actually, for voters, a vote to support Netanyahu via his allies. AMY GOODMAN: Do you see this as a referendum on Netanyahu’s 10-year rule? And also, the significance of these last two moves he made in the last week, one with Trump in the United States right before Netanyahu flew back to Israel, Trump announcing the acceptance of, recognizing the sovereignty of Israel over the occupied Golan Heights, and then the last announcement, the day before the election, that Israel would annex the West Bank settlements, what that means? HAGGAI MATAR: Definitely. So, we can also add to that the moving of the American Embassy to Jerusalem last year. It seems like a long time ago, but I think it’s all very relevant, because what all these measures are doing and saying is that there’s an old kind of balance that we used to talk about in Israeli politics, wherein Israel, the one thing — the two things that Israel can get from moving towards peace, moving toward ending the occupation, are, one, safety and security, and, two, international recognition and legitimacy, for all sorts of things that Israel wants. Basically what — sorry — Trump has been doing to support Netanyahu is offering sorts of legitimacy to Israel without any conditions — so, moving the embassy to Jerusalem without conditioning a partition of the city; recognizing the annexation of the Golan Heights, basically giving up on any sort of negotiations, in this case with the Syrians; basically, giving Netanyahu a green light to annex part of the West Bank, as well, because you don’t need Palestinians to agree to this, because, there you go, you have international legitimacy even without any negotiations. So, with that, and at the same time with Netanyahu succeeding to offer Israelis safety and security, a very, very low mortality rate as part of the conflict, as part of the occupation and siege, unlike Palestinians that are being killed en masse by Israel, Israelis are not really being killed as much. So, for Israelis, this is actually a rational choice, to support a status quo where there’s international recognition, there’s safety and security and an economy that’s generally blooming. Why not continue with Netanyahu? JUAN GONZÁLEZ: And we’re also joined by Diana Buttu, a Palestinian attorney, has been an adviser to President Mahmoud Abbas in negotiations with Israel. Your reaction to the elections and also to what appears to be historically low turnout by the Palestinian citizens of Israel, what the significance of that is? DIANA BUTTU: In terms of the reaction vis-à-vis the outcome that we’ve seen, this was, in effect — for Palestinians at least, this was an election in which you either choose Trump or you choose Trump. The positions that both Likud took and Benny Gantz took were virtually indistinguishable, particularly when it came to Palestinians. They bragged about how much they were going to beat up on Palestinians, and then took their voters as a result. So, it’s not at all surprising that we see this outcome, given that we really had two candidates that were quite mirroring one another when it came to this election. In terms of the voter turnout, there were a number of factors in terms of low Palestinian voter turnout. One was the fact that a number of people have ideologically chosen to boycott. And then others was because there was a level of voter intimidation and people also believing that their MKs, their members of Knesset, were unable to deliver. The big problem, however, is that we’ve seen a rise in fascism in Israel, and instead of people boycotting, we were hoping to see that people would have come out in greater numbers to try to at least push back against that tide. As it stands right now, although the vote — the ballots have not been completely counted, we really only have about 15 out of 120 members of Knesset who believe in equality and who believe in an end to the occupation. And that’s a very sad indication of where Israel is. AMY GOODMAN: Diana Buttu, can you explain who can vote in the Israeli elections and who can’t? And also respond to these 1,200 cameras being put in the election booths, the polling places of — in Arab neighborhoods. DIANA BUTTU: Yes, definitely. In terms of who can vote, it’s only citizens of Israel who are allowed to vote. And so, of that citizenry, about 16% of the people who are eligible to vote are Palestinians who are citizens of Israel. But then you look at the vast remainder of people that Israel controls, whether it’s people who live in the West Bank, in the Gaza Strip or in Israeli-occupied East Jerusalem. You’re looking at close to 6 million individuals who are ineligible to vote in Israeli elections, and yet are being governed by Israel. 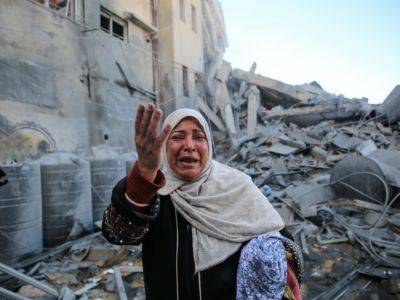 In terms of the cameras, this is not only a violation of Israeli law, but it was something that the Israeli prime minister brazenly is supporting and had came out and said, “Yes, we shouldn’t be worried about this. There should be cameras in all polling stations.” The reason this, of course, is so alarming is the fact that this leads to voter intimidation. There are a number of Palestinians who are working either as teachers, in other ministries, and who, seeing that there is a camera in place, feel, rightfully so, that their votes are being monitored, whether they show up to the polls or who it is that they’re going to be voting for. And so, this type of voter intimidation is the type of action that Netanyahu has done, not only when it came to this election, but in previous elections, where he tried to claim that Arabs were, quote, “voting in droves.” He is ideologically opposed to Palestinian freedom, ideologically opposed to Palestinians having equality, and will do anything that it takes to try to intimidate and to try to make sure that there is perpetual control over Palestinian lives. AMY GOODMAN: We’re going to break and then come back to our discussion. We’re speaking with Diana Buttu in Haifa, Palestinian attorney, and Haggai Matar, an Israeli journalist with 972, activist and union organizer. He’s speaking to us from Tel Aviv. Stay with us.